Details Jarosite is a yellow-colored, hydrous sulfate of iron and potash mineral occurring in sulfurous layers of iron ore. 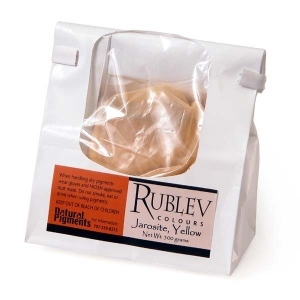 The color of the mineral is amber yellow, but sometimes brownish-yellow. Our jarosite is from the Zhuravlinskogo deposits in Perm, Russia, and is a bright golden yellow that is opaque, exhibits good covering power and works well in all medium. Previously not known as a historical pigment, jarosite was recently identified as the yellow pigment in the murals of the temples of Karnak, Egypt. Jarosite, named in 1852 after the typical locality of its discovery, Barranco Jaroso, in southern Spain. It is a hydrous sulfate of iron and potash mineral occurring in minute rhombohedral (actually a combination of two trigonal pyramids) crystals. Jarosite crystals are somewhat scarce and small. The mineral is more commonly encountered as earthy masses, films or crusts, botryoidal and granular. It is formed during the weathering of sulfurous layers of iron ore. Jarosite is an uncommon mineral, yet it is present in small quantities in almost all layers containing iron sulfides. It is often associated with barite, turquoise, galena, goethite, limonite, hematite and other iron minerals. Notable occurrences of jarosite include the Jaroso ravine, Sierra Almagrera, Spain; Iron Arrow Mine, Colorado; and Maricopa County, California, U.S. In the former Soviet Union, deposits of jarosite are found in the Achi-Say layers of Kazakhstan and Zhuravlinskogo in the Perm region of Russia. 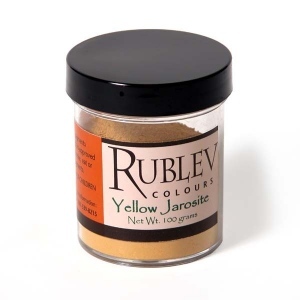 We obtain our jarosite pigment from the Zhuravlinskogo deposits in Perm, Russia. The sulfate content of iron oxide pigments rarely exceeds one percent, yet in the mineral jarosite sulfides can be as much as 25 to 35% of its composition. Although sulfide pigments have been known to be unstable, a study by K. I. Tolstikhinoy showed that jarosite is resistant to atmospheric gases, is lightfast and possess good hiding power. Jarosite absorbs a moderate amount of oil during dispersion and forms a good flexible film. Jarosite is not considered toxic but care should be used in handling the dry powder pigment so as not to inhale the dust.